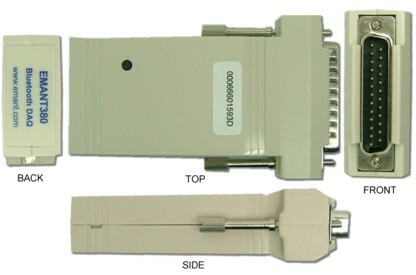 Low cost and easily available 25 pin D-Sub connects to the physical world. Application adaptors with instructional guides for fuss free learning. The EMANT380 is a low-cost and compact 24 bit wireless (DAQ) data acquisition module developed for learning purposes. As a wireless DAQ module, it is useful in appplications where isolation is important. It can be used readily with a desktop personal computer for data acquisition and control. When connected to a notebook or smartphone, portability is achieved. Together with the communication capabilities inherent in the computer or smartphone, it allows learners to experiment and design solutions that capture, control, compute and collaborate with the world. Using the internet connectivity, the same voltage can now be read across the world using email, browser or messenger. Connected to an Android smartphone, this information is now accessible wherever there is a phone signal. Simple examples are provided with instructional guide to allow the learner to explore and build on the knowledge.